Although some types of fossils are harder to reach or recognize, is easy to learn how to collect them. However, paleontology is not just 'digging up fossils.' The difficult part is knowing whether it is legal and/or ethical to do so. If no information is recorded about the fossil when it is removed from the ground, the specimen is lost to science. Over the years, much information has been lost about fossils through innocent collecting by tourists on vacation, commercial collecting, looting, and haphazard data collection. At one point in time, concerns about fossil ethics were mainly felt by scientists, but now with strict collecting laws and permitting requirements in place, unethical collecting may lead to a stiff fine, and even imprisonment. For instance, in England you can collect dinosaurs between the high water and low water marks on the beaches, but if you tried to collect a mosasaur without a permit on the shores of Fort Peck Lake in the Hell Creek Formation of Montana, you would find yourself in prison or heavily fined. Tyrannosaurus Sue - listen to this NPR news story about the acquisition of Tyrannosaurus Sue by the Chicago Field Museum. It is often legal to collect many fossils (brachiopods, trilobites, clams and most invertebrates, petrified wood), BUT one must be careful as laws vary. It is ALWAYS illegal to collect fossils or even rocks in National Parks and Monuments. Collecting on private land is at the discretion of the land owner. Even if on private land, if a find seems unusual or unique, collectors are encouraged to bring their finds to the attention of researchers, as there is important information in precisely how and where the fossils are in the ground. IMPORTANT NOTE: CARELESS COLLECTING CAUSES THE LOSS OF VALUABLE INFORMATION! 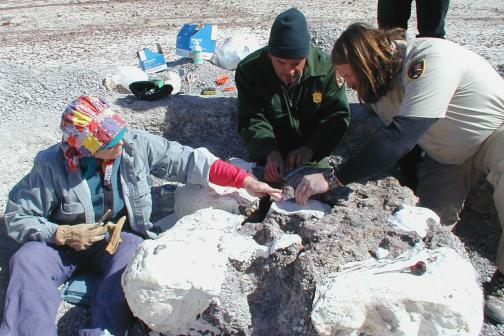 Government organizations have a permitting structure in place for people to apply to surface collecting or excavating fossils on public land if there is a scientific purpose. For information on permitting for fossil excavation or collection on Bureau of Land Management land, contact your local field office for details on permits. For information on excavation or surface collection on National Park Service lands, contact the National Park office on interest and inquire with the park managers about permits. For information on excavation or surface collection on National Forest Service lands, look through this page on special use permits. For information on excavation or surface collection from State Parks, contact the appropriate state park, and inquire about a permit through the park manager or state park management. If you can not manage to get a permit, please do not collect illegally! There are other ways to satisfy your thirst for paleontology. Consider the numerous digs going on around the nation and the world with universities or natural history museums. Also, if you have to have that shark tooth, or a clam shell, think about visiting a state park where you can collect legally like Flag Pond Nature Park in Calvert County, Maryland, or collect 25 lbs. of fossil wood on a day excursion in Montana on BLM land for personal use. If you find something significant, leave it in place! Go and tell an official about the location, and give them your contact information. If you keep in touch, they will probably send you pictures if it turns out to be a good find. Ethics are of great concern to academics and other professionals in paleontology. You can not belong to a single major professional society without being conscious of ethics. Some ethical codes are more severe than others, but one thing is clear, you can not collect illegally, and in some cases, you can not trade in fossils and be a paleontologist in the organization because it is a conflict of interest. The Society of Vertebrate Paleontology Ethics Statement.